Photos by Nancy Shackelford (bottom left), Matthew Morrison (top left), and Sarein Basi-Primeau (right, fruiting plant). 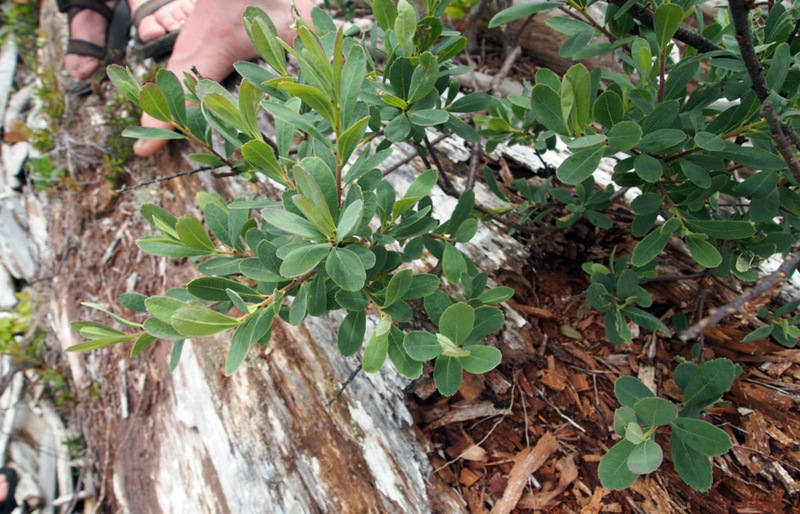 This shrub grows up to 1.5 m tall and has reddish, loosely-branched stems with deciduous leaves. The leaves are lance-shaped with a rounded end that has a few jagged teeth on both sides, forming a small point. 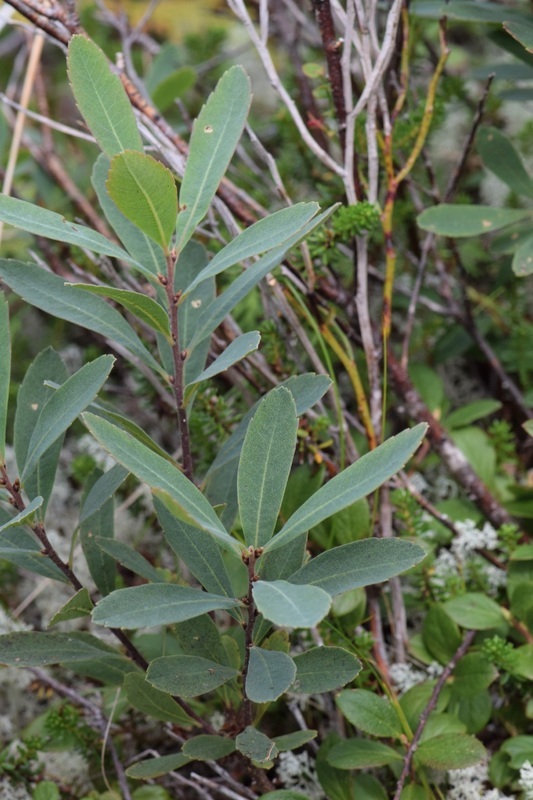 The tops and undersides of the leaves are spotted with yellow wax glands, and the undersides are a more whitish colour than the top. The leaves branch off the stem in an alternating fashion. The brown cones seen in the right-hand photo are present year-round, and contain the plant's small greenish-yellow fruits during fruiting season. The flowers are greenish-yellow and in catkin form, and can be found on the plant before the leaves appear. Sweet gale is dioecious, meaning the male and female flowers are on separate plants; the male catkins grow to 2 cm, and the female catkins reach just 1 cm. Sweet gale usually grows in low elevations in and around wetlands, such as swamps, bogs, fens, and on the edges of lakeshores and estuaries. It is quite shade intolerant, so won't be found in areas dominated by taller shrubs or trees. This species is found in many places around the world. On the west coast of North America sweet gale is found from Oregon up to Alaska, and from there into the Yukon and Northwest Territories. It is also found on the east coast, in Nova Scotia and some of the eastern United States. It is also found in northern Eurasia. There are no common species along the Central Coast with which sweet gale could be confused. 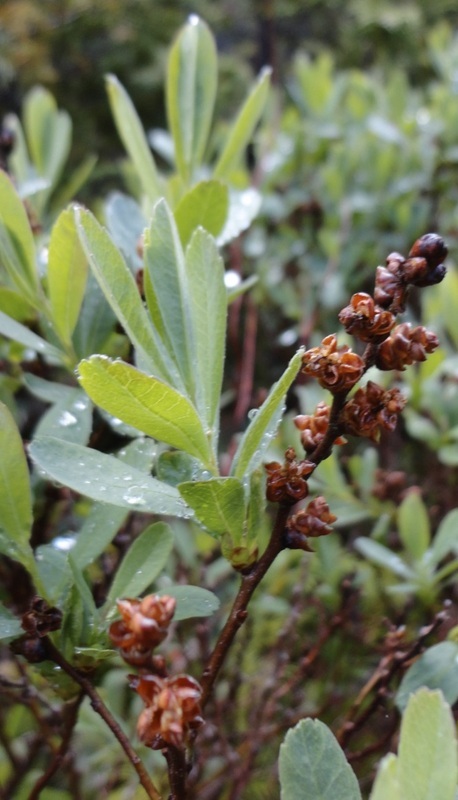 California wax-myrtle, a more southern species, appears sporadically on the west coast of Vancouver Island. However its leaves are narrower and more pointed at the ends. Historically sweet gale had a variety of purposes and was widely used in Europe. The leaves were used to freshen linen, and the catkins and cones were used for making scented candles. It was also used as an insecticide by Swedes. Its aroma is still used for aromatherapy, in soaps, and in insect repellants. The branches had uses as well: the bark for dye, and whole branches as a substitute for hops in beer-making. Gale beer is still made today. Here you'll find sweet gale in a traditional recipe by an Ontario brewery, and on this site you will find a it in a Viking-style ale under the name Gotlandskricka. Sweet gale is a key nitrogen-fixer. Pojar, J. and MacKinnon, A. (1994). Plants of Coastal British Columbia, Revised. Vancouver, BC: Lone Pine Publishing. P. 81.